“Beyond the mountains, more mountains” Our guide, Eddie, gestures broadly to the horizon. “That’s a Haitian proverb. It reminds you not to think you are that important; there is always someone greater than you.” Looking out at the mountainous landscape surrounding the ruins of the Citadel of Henri Christophe, I find myself wondering about other interpretations. The land here is beautiful, lush and tropical. The mountains jagged in every direction until the land hits the sea, the Northern Coast of Haiti. Eddie points to where Columbus’s Santa María ran aground, the point of colonization. The Citadel and nearby ruined palace of Sans-Souci represent the lost dream of the Haitian king (and former slave), Henri Christophe. Christophe, together with Jean-Jacques Dessalines, launched the world’s first successful slave rebellion, dramatically overthrowing the French — who were outnumbered by a factor of more than ten. Christophe’s rule was mixed with Napoleanic ambitions and European ideals. He was widely disliked as an autocratic monarch and he committed suicide in 1820 before his visions were ever realized. His palace was destroyed by an earthquake shortly after. Slowly the land is reclaiming the ruin. With a history of ship wrecks, revolutions, earthquakes, and political struggles (past and present), “mountains beyond mountains” could easily also represent the centuries long struggle between the people of Haiti, their country and their land. My volunteer assignment was as a graphic designer and consultant working with two different agricultural associations in two cities (Port-au-Prince and Cap-Haïtien) to develop branding and label designs for new and current product lines. Supermarket research. Client’s product with old labels in top right. Products from Haiti face steep competition from cheap American and Latin American imports. My clients, Anatraf and Makouti are working to change that. They offer training and through a co-op, pool resources to allow small producers to bring products to market. Their goal is for Haitian farmers to evolve their subsistence farming practices into entrepreneurial endeavors. They are making products they want Haitian people to be proud to buy and that will be desirable as an export to the U.S. and French markets specifically. It was no small task to immerse myself fully in Haitian culture, to understand the challenge of bringing products to market in Haiti, to determine what messaging and visuals were important to consumers, and finally to create a meaningful and versatile design that speaks to a diverse audience within in a two week time period. My journey didn’t start at the palace ruins on the mountaintop, it started in Port-au-Prince. To leave the chaotic airport in Port-au-Prince is to step into an unknown world. 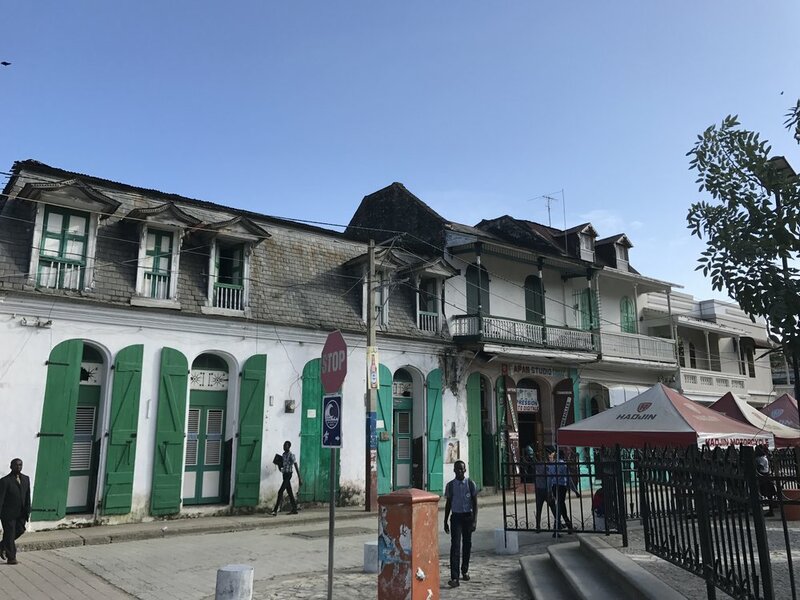 There is a narrow, fenced path leading to the parking lot and on either side, hundreds of people shout for your attention in Creole, arms outstretched. It feels like a bizzaro red carpet runway, where carrying your luggage is the equivalent of an autograph. I find Stessy, field officer for Farmer-to-Farmer; her warm smile cuts through the pandemonium. “Welcome to Haiti.” She says. I’m not sure anything could have prepared me for the extremes of human experience on display in Port-au-Prince. All is presented in striking contrast. There are the business people in high fashion clothes, bold prints, bright colors, crisp, and ironed, walking the streets, carefully avoiding rubbish piles (many burning), and stagnant water. There are the people taking a sledgehammer to a pile of rubble to remove the twisted rebar. While, Ferraris navigate the hills of Petionville, the colorful Tap-Tap — a pick-up truck with an arched, brightly painted metal covering — serves as the main form of public transportation, swerving in and out of traffic. Commuters hang off the back, as if riding a San Francisco trolley. Drainage ditches crisscross the city serving as open sewers. I saw children, barely clothed throwing rocks at the wild dogs, while others, as old as 10, in matching school uniforms walk hand in hand. All of these things co-exist. The sadness, the joy, the despair and the hope. You feel this intensely. Tourists rarely drive in Port-au-Prince and many locals who can afford it navigate by private car. Stessy and I did not have a private driver, but we used the driver and the car offered to us by our client, Anatraf. The car was an old Land Rover with no seatbelts, no air conditioning and with a busted side view mirror. Right away the street scene is jarring. The area around the airport is adjacent to Cité Soleil where, post-earthquake, up to 400,000 people live in extreme poverty. It is one of the biggest slums in the world, and most dangerous due to its rule by gangs. There are no stop signs, no lane lines, no traffic lights. Cars battle head to head when crossing intersections in a game of chicken. Storefronts, known as “Borlettes” are plentiful. Haitians place bets on the New York Lotto. “We’re not driving, we’re surfing,” my guide tells me, and it does seem as though there is an art to driving in Haiti. Emissions regulations are non-existent, and it appears every car is maximized for pollution. Structures in this part of town consist mostly of bare slump block walls and an angled corrugated steel roof. Excess rebar sticks out haphazardly. The structures that do have stucco covering are often painted in bright colors and with decorative lettering, standing out in contrast to the grim surroundings. My resort hotel with its pool and tropical drink menu is perched atop a small hill, a mile or so from Cité Soleil. Multiple armed guards protect the exterior. Recent election protests and riots associated has everyone on high alert. The hotel boasts satellite TV service (mostly American sports), wifi, running water (never hot), and electricity (with multiple short-lived outages daily). The restaurant serves Haitian and international dishes (including surprisingly good pizza) with cloth napkins, and fine silverware, but large chunks of concrete are missing from the steps down to the pool. Stessy and I sample the cremasse. On average, there were less than 10 overnight guests at a time, including myself. I was the only female traveling alone. Much of the time, I was the only female. But, during lunch and dinner the hotel was sometimes bustling with Port-au-Prince locals conducting business meetings, or aid/construction groups stopping by on their way to or from the airport. Large parties of American doctors, nurses, and surgeons would stop for a feast on their way to a far-flung locale. I feel foolish explaining to these humanitarian workers my role here. My work pales in comparison to theirs, and feels inadequate when you consider the dire need. The kick off meeting with my client was much like any other project kick off. We discussed the line of products produced by Anatraf, their target markets, their current designs, their vision for the future of the brand. Stessy translated, although our Fulbright scholar client spoke great English. We decided to keep the parent company, Anatraf on the label as a logo (previously developed) but to use their new name “Goutana” as the consumer-facing brand name. Goutana means “Taste of Ana,” which stands for Anatraf. They wanted the brand to communicate quality and evoke pride in Haiti. They wanted to bring the packaging up to international standards in regards to nutrition facts, ingredients lists and other mandatory information. I was happy to dive in. Day three in Port-au-Prince was our market research day. Stessy and I joined Anatraf’s distribution manager and visited four markets where products would be sold. We visited to get an idea for the competition and review the label designs of other Haitian and import products. This was a grand, behind-the-scenes tour of Port-au-Prince. Nearly every drive in Haiti involves some unexpected stops. Not knowing the Creole language, I was left to guess the nature of these stops. One time, our driver pulled into private parking lot with large gates, heavily guarded. He got out of the car, locking the doors with us inside. He walked over to a chain link fence, had a brief conversation with someone on the other side. They quickly exchanged money. Our driver got back into the car and our journey continued. These strange, quick pit stops seem to be par for the course. My hired taxi on the way to the airport in Cap-Haïtien stopped mid-ride to haggle with the proprietor of a lotto booth for five minutes, before resuming our journey. On the market day with my client we made six stops in addition to the four market visits. We dropped off merchandise at the nicest hotel in the hills, we stopped on a quiet bougainvillea-lined neighborhood alley, we got an estimate from an auto mechanic, and visited an industrial site. None of these stops were explained to me, but I basically gathered that we were going through the daily errands of Anatraf’s distribution manager. Distribution was tedious work in Port-au-Prince. Anatraf personally delivered products to all their stores, labeled it and shelved it on the spot. They would then have to regularly follow up with the stores to receive payment (products were on consignment) and to pick up expired products. We visited a wide range of markets. There was a very modern “super” store (that would not be out of place anywhere in America, save for the armed guards) in the wealthy hillside suburb of Petionville, and a cramped market in Delmas with missing floor tiles and fans circulating an odor of semi-rotten food due to spotty refrigeration. In general most markets were for the middle to upper class. A blurry shot, but gives you the idea of the street markets. For others, every busy street is a market, where men and women set up “shops” on a portion of the narrow sidewalk. Products available for purchase street side range from socks to auto parts to tropical fruits. In downtown Port-au-Prince — close to the presidential palace — these street shops are larger in size, with one proprietor taking up a half a city block with his wares. Each vendor has their specialty. The backdrop of these shops were ruined facades of buildings destroyed by the 2010 earthquake. To my eyes, the damage was still raw, exposed, and painful. But daily life moves forward, and merchants integrate the jagged walls into their displays like a post-apocalyptic vendor fair. It feels as if nothing in Haiti goes according to plan and people thrive in, or are ambivalent to the disorder. I was going to stay at my hotel in Port-au-Prince for one day, then it was changed to five. Our market day was Monday, then it was changed to Tuesday. We were going to review the first design proof on Wednesday, then it changed to Thursday. I was going to visit a mountain town for one night, then it was two, then it was one again. When my hotel was booked, it was booked twice by my client and my guide. My flight from Port-au-Prince to Cap-Haïtien needed to be re-scheduled. Meeting times were given to me within one hour ranges, and even then I waited longer. All of this is due to a combination of factors. First, is traffic. It seems at nearly all times of the day there are massive jams that bring vehicles to a standstill. This makes estimating time hard. Second, the communication infrastructure is lacking. While cell phones are abundant, power is not. So Haitians are constantly in need of a charge. Basic “burner” phones are common for texting and calling. Only the wealthy can afford a smart phone. Since wifi is unreliable everywhere, businessmen turn their mobile phones into a hot spot in order to access the internet in short bursts. Finally, Haitian culture — which is very focused on living in the present moment — is a factor. The “time is money” mentality that exists in America is non-existent. People linger. As I eased into my stay, I fell into the rhythm, letting tomorrow happen rather than discussing the agenda in advance. I had to learn to let go of some control. The lowest point of my trip was day four of seven in Port-au-Prince. I had set up my office by the pool, earbuds in, when suddenly, from outside the hotel, I heard multiple gunshots. I peered through the fence from our hillside perch and saw a man on the ground in the parking lot of the industrial area across the street. A large crowd emerged from nowhere, running to the man, screaming. A waiter joined me, overlooking the scene. He shook his head, “It happens,” he said. The cries were loud and lasted for five minutes, and then everyone disappeared. There was no police response, no caution tape. Close to the hotel, Cité Soleil. By day seven, after a productive yet emotional week, I was ready to escape Port-au-Princ. My client had arranged for Stessy and I to attend a mountain fair in a rural town. There I was to meet the director of Anatraf, and see the product on display at a festival of local food and culture. “Have you tried klerin?” a dread-locked Haitian man asks me. “Not yet,” I respond, and he offers me a sip of the distilled, unfiltered white rum. It is sweet, infused with herbs and known for its therapeutic properties he informs me. The man is Headley, and aside from Stessy, he is my first Haitian friend. He has a European look about him, and carries a man satchel. He is from this village, but lives in Berlin for now. Like many of the English–speaking Haitians I have met, he studied in the U.S. Stessy and I had traveled two hours south along the coast and then up into a remote mountain village outside of the town of Petit-Goâve. Away from the hectic atmosphere of the city, I see my first glimpse into Haitian culture, rooted in family and community. The mountain fair was on an open, rocky and grassy area of a mountaintop dotted with tropical vegetation. There was a covered, cement structure which served as the market, and a simple stage with a thatched roof. A basketball court doubled as a dance floor. Dotted across the landscape, various artisans were selling their art and crafts. It was like any fair anywhere in the world with school groups, families and community members coming together in celebration. Then again, there was a four year old boy starting a fire for the charcoal, wild dogs roaming free, motorcyles meandering through the pedestrian crowd, and an old woman holding a live chicken on a string upside down. I tried soup joumou, a squash soup known as the soup of independence, which is consumed during the holidays and around the new year — January 1 is Haitian Independence Day. The evening brought a theater performance depicting a Vodou (Haitian spelling) play with dancing and drumming. As a religion, Vodou is still revered and practiced by rural Haitians. Performed in Creole, the play’s meaning was lost on me, but I loved how the crowd seemed to laugh, dance, ohhh and ahhh in sync. The play gave way to musical performances and as the sun set, the mountaintops were filled with Haitian rhythms. We drove back from our mountain escape on Sunday. In the outskirts of Port-au-Prince, traffic came to a dead stop on the only road into town. It was approximately a four-lane road (there are no lane lines) but cars were packed in five deep, inching past each other in a game of cat and mouse. Somehow, hoards of motorcycles weave through this mess. Pollution poured through the open windows of our Land Rover with no air conditioning. Pedestrians walked in droves on the sidewalk, and we inched along behind them. Proof 1: Three design options for red wine and pineapple jam. All through the city and mountain adventures, I worked on the labels for Anatraf, first presenting three design options for two products — a jam and wine. The client chose a design and with some modifications, I soon had my template that would be applied to the 17 products. There was some trial and error in finding photographs that correctly reflect the varietal of fruit found in Haiti. 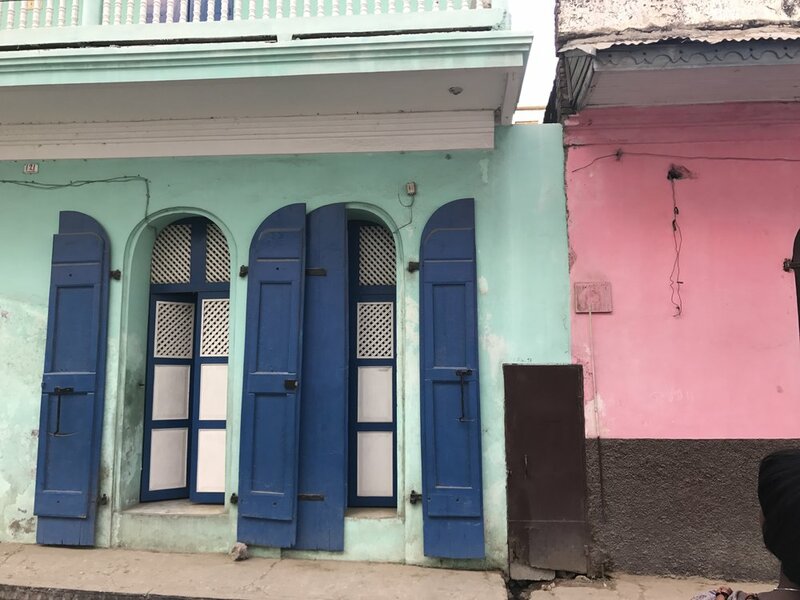 Color inspiration from Haitian storefronts. Color palettes were inspired by the colorful paint combinations decorating the storefronts of Port-au-Prince. Each fruit product was assigned a color that would be used as the background of the label and paired with secondary, complementary colors. The client was pleased, and most of the feedback revolved around translations, photographic selections and branding hierarchy. Seven of the final 17 labels designed for Anatraf. Feeling revived by the mountain fair and proud of the work I had done thus far, I packed my bags for Cap-Haïtien. Cap-Haïtien is a city in Northern Haiti, a quick, 28 minute flight from Port-au-Prince. It is my second week in Haiti and I am excited for a change of scenery. I am here to work with another agricultural association — Makouti — the dream of a man who is also my airport pick up. Benito playing around at the Cap-Haïtien radio station where he has a regular show. Benito is the Country Coordinator of the Farmer-to-Farmer program. In Cap-Haïtien, he was my client and guide. One of the most inspirational people I have ever met, Benito spends his time overseeing his training program and working with local farmers to bring quality products to a larger customer base. Additionally, he teaches at a high school, has a weekly radio show, and maintains a charitable giving program to help send rural children to school. He has traveled the world and went to college in the U.S. and Argentina. He is fluent in four languages. Post-earthquake, he arranged for medical supplies from the U.S. to be delivered to hospitals in Cap-Haïtien so they could respond to the surge in patients arriving from Port-au-Prince. Immediately I am drawn to him with his warm smile, gentle manner, professorial way of speaking and conviction of ideas. He has kind eyes and is overflowing with passion for life. He believes in Haiti and his optimism is contagious. Buying a coconut from a local farmer. The chocolate was sold raw, in circular tablets, individually or packaged in threes. It needed a front and back circular sticker, and a hang tag for the three-pack that would be sold in local markets. The honey was bottled in three sizes and sold locally. I had to include an existing graphic as an identifier for the brand, but developed a simple, bold type treatment to serve as the main logotype. To create visual interest and provide contrast between products, I designed three patterns specific to each product. These labels needed a blank version as well, so that in the future my client could place the template (with branding and product name only) into a PowerPoint page and overlay the information that would change over time. To this end, I provided the client with fonts, and the full specs of each text area so he can easily load the fonts and replicate the style. One of many “bon babay” storefronts in Cap-Haïtien. On my “tourist day,” Benito and I drive an hour outside the city to see the Sans-Souci palace and the Citadel of Henri Christophe in the mountains. The site was nearly deserted the day we visited, even though it was Saturday at one of the biggest tourist destinations in Haiti. Locals zero in on us offering a variety of jewelry and souvenir products. The hike up to the citadel is only about a mile long, but has a steep incline. A mule ride is offered for the journey, but we opt to hike. The views were astounding, and the citadel offered many exciting discoveries, including the meticulously stacked cannonball piles and the cannons themselves of British origin, decorated ornately with art and insignia. “It’s too bad you leave Sunday, because Sunday is fun day in Haiti,” my new friend, a Canadian tour guide operator, texts me. I met him at Cormier, a beach resort I had made my office the previous day. It’s my last night in Haiti. I’m drinking alone at the hotel where the only other company is a small, sober group of missionaries from some Southern state. My Canadian friend tells me he will pick me up in five. He arrived at the hotel to pick me up with his business partner, a Haitian of German and African ancestry — his family having arrived in the newly independent nation in the early 1800s. 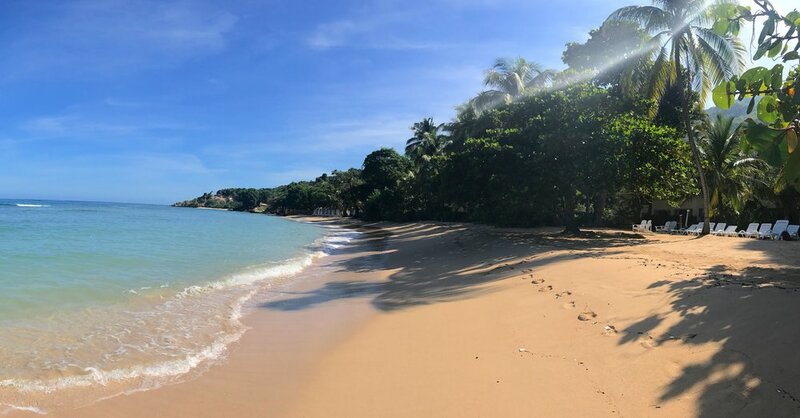 The two of them run their tour operation out of Labadee, a private beach resort that is frequented by a Royal Caribbean cruise ship full of tourists eager to explore the white sand beaches and snorkel the blue-green waters. Like all the Haitians I have met, he is passionate about his country and we discuss in depth the lackluster tourism industry, the perceptions of Haiti abroad, and the negative impact of international aid. I had read before I arrived that Haiti has a complicated relationship with foreign aid. Major disasters have throw an already fledgling country into states of emergency, dependent on outside support to meet basic needs. But, long term interventions by the U.S. and the UN (specifically MINUSTAH, the military stabilization force) breeds animosity. NGOs are plentiful, but not coordinated, so there is much redundancy and not much sharing of resources. Some NGOs have become profitable as charity organizations, offering little by way of helping Haitians kick start their own economy. Then there are the American corporations looking at Haiti as a source of cheap labor, only 90 minute flight from Miami. My new friends tell me that to really help Haiti, we need to support the Haitian people in their efforts to create their own economy. Reflecting on my small contribution, I sincerely hope it helps to that end. Signboards advertising performances at Boukanye. I am grateful for the valuable conversations and to my new friends for taking me out on my last night. 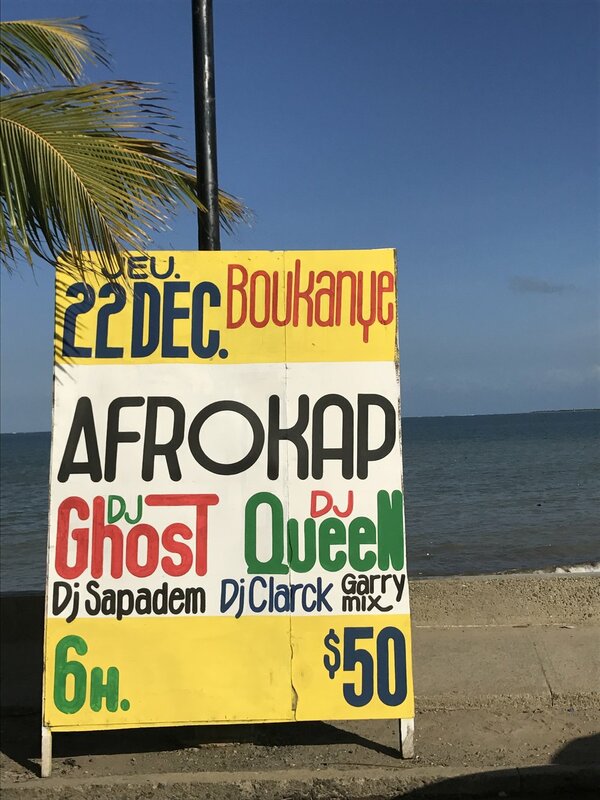 We arrive at Boukanye, the swankiest, club in Cap-Haïtien. It is Saturday night and all week 10ft tall sign boards placed on street corners across town have advertised this show: Jazz Sa, Robert Martino, and friends. Attendees are dressed from business casual to full cocktail attire. The venue is almost entirely open air, with a cool breeze running through the palm trees and a sky full of stars. Boukanye club, Cap-Haïtien photo by Boukanye. I trade off dancing with my Canadian and Haitian friends. Haitians know every beat of the kompa songs, humming along, spinning their partners with gusto. The Canadian and I laugh and fumble along, trying our best to mimic the couples around us. A third piña colada is ordered. The singer on stage with gold sequin dress sings a breathy version of Bob Marley and Lauryn Hill’s Turn your Lights Down Low. For the first time on the whole trip, I feel fully relaxed, happy, living in the moment. When it is time to go, my Canadian friend offers me a slow motorcycle ride up the eight steep blocks to my hotel on the hillside. It is 2am, the streets are clear and it’s my first ride on a motorcycle. We glide down the boulevard, and wind up the narrow streets. Within a month or two, the 21 labels I designed for these two different agriculture groups should be in full use by the associations, thereby enabling them to put their products proudly on the shelves of the high end markets of Petionville and market those products as an export. The goal is to increase demand and profits so as to directly benefit the farmers who are members of the association. Farmer-to-Farmer will be checking in over the coming months to track the impact. Within six months to a year, the organizations will need more labels. My work will have to be built upon, requiring another volunteer to step in, or the talent to be sourced locally (a challenge). This is the inherent problem with any volunteer work. It needs to be consistent or else its value is lost. “Thank you for trusting my people enough to come,” my text from Benito reads. The text brought tears to my eyes. Many will never get to visit Haiti; they will never see the place behind the headlines. I came wanting to see and share a positive image of Haiti. A Haiti with opportunity and promise. My photos show the lush tropical landscape, white sand beaches, the bright, colorful buildings that populate the landscape. But I did not take photos of the crowd of people crying in agony outside of my hotel in Port-au-Prince, or of the man pushing the wheelbarrow piled high with dirty mattresses, or the drainage ditches teaming with burning trash, wastewater, and wild hogs. I didn’t take those photos, but they weigh heavy in my mind. 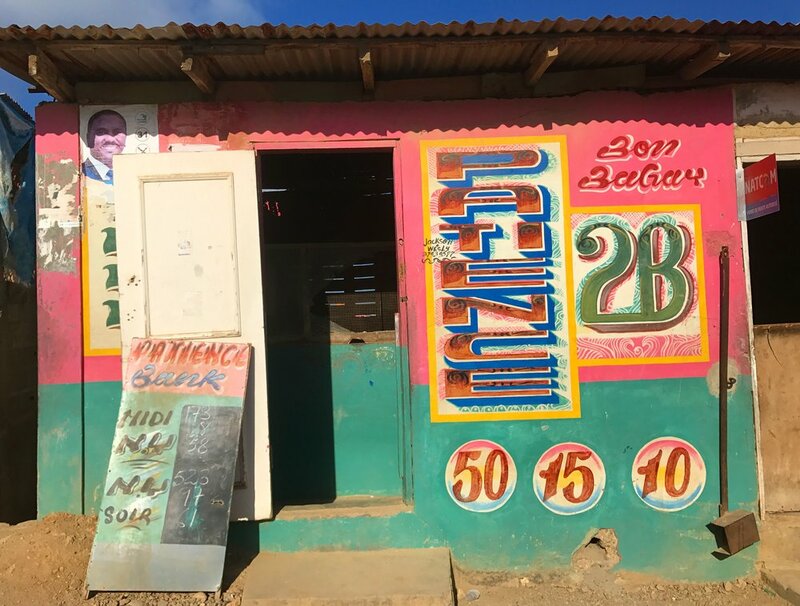 A painted sign in Port-au-Prince declares, “Haiti, Yon Jou la Jou.” Stessy tells me it translates as, “One Day it Will be Day.” She says it is a hopeful saying, that one day light will replace the dark. I am grateful for my experience in Haiti, and for the people I met there who already are this light. Thank you to Partners of the Americas, Farmer-to-Farmer program for sending me on this great adventure. Thanks to my friend Mette Hornung Rankin for passing the opportunity to me and to Stessy and Benito for being stellar guides and translators. Traveling alone is daunting — thanks to Headley, Cameron, Matt, James, and Moralus and Conrad, for drinks and friendship. Photos from the mountain fair.